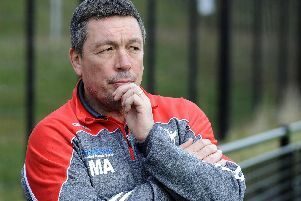 Mark Aston will settle for week-on-week improvement from his Sheffield Eagles outfit as he continues to make tentative early steps with his new-look side. Aston has stated that late player arrivals during the close season left the Eagles undercooked for the season opener against Dewsbury, but the long-serving coach was also encouraged by certain aspects of his side’s display. Now faced with a trip to Halifax tomorrow, Aston knows Richard Marshall’s side will be bolstered by their dual-reg agreement with Castleford, as well as new loan signing Daniel Murray who penned a deal on Thursday from Salford. It is early days though, with the 50-year-old keen to see his side make improvements with each round. “If we can get some improvement then we are going in the right direction. That’s the key,” he said. Aston will be bolstered by dual reg himself with the likes of Jack Ashworth, Matty Lees, Jake Spedding and James Bentley all available for a second week running from St Helens. With Castleford loanees Cory Aston and Garry Lo also available, Aston can only select five from six, with Lo missing out last weekend. Aston has no injury concerns from the opener with Dewsbury and has options, with the likes of Greg Burns and Ollie Davies waiting in the wings after missing out last week. “No-one really picked up an injury, just the usual bumps and bruises,” Aston confirmed.